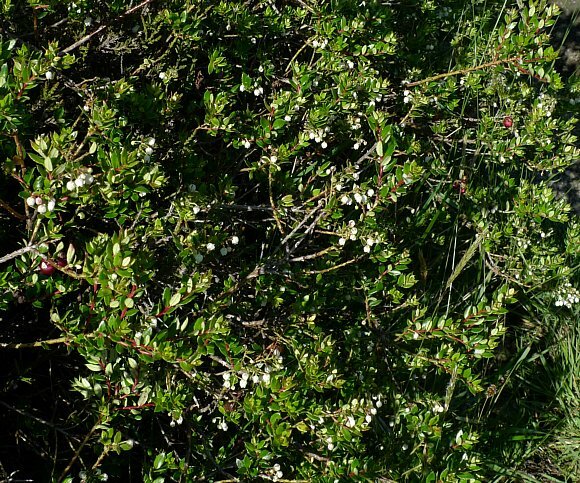 Spreading up an acid-soil dell by suckering (white-speckled shrubs). 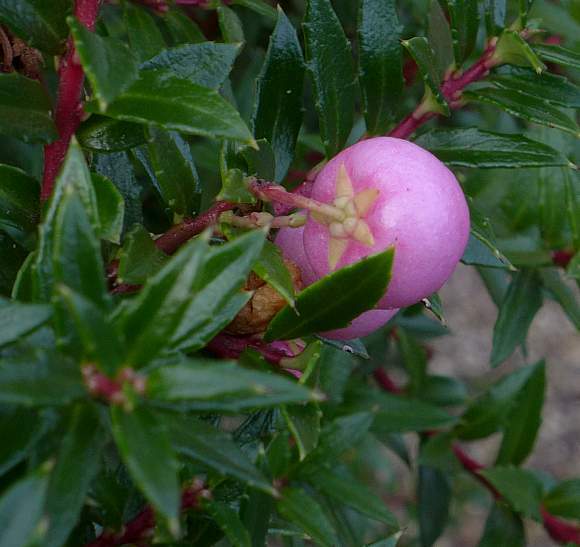 Part of a shrub with both white flowers and largish magenta berries. 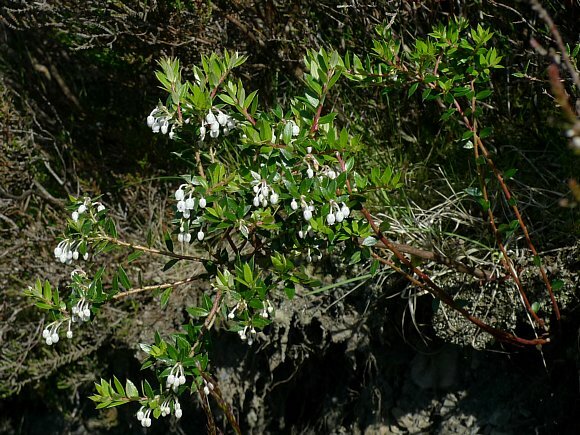 Flowers hang down in small gatherings from reddened woody branches with smallish glossy leaves. Stems bright red in places. 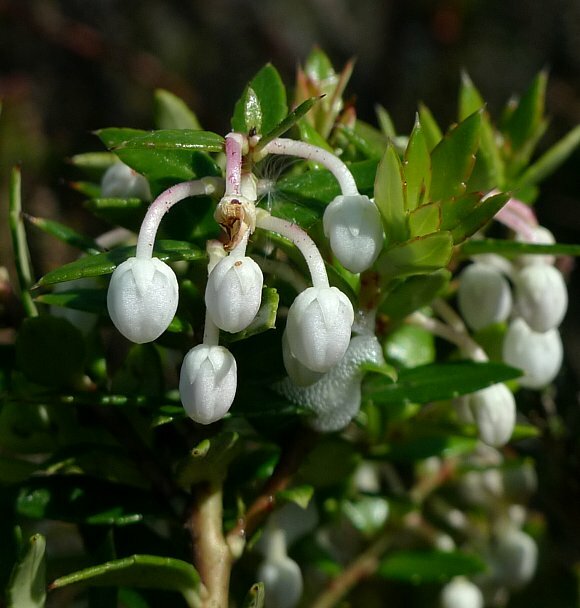 Flowers are brilliant white and bell-shaped, typically heather-type. Leaves elliptical with a longish point at the end. 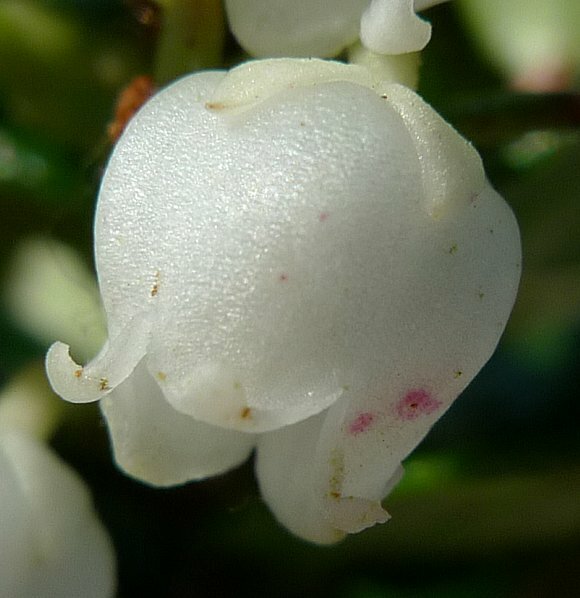 Flowers droop downwards in small bunches; un-opened ones egg-shaped. 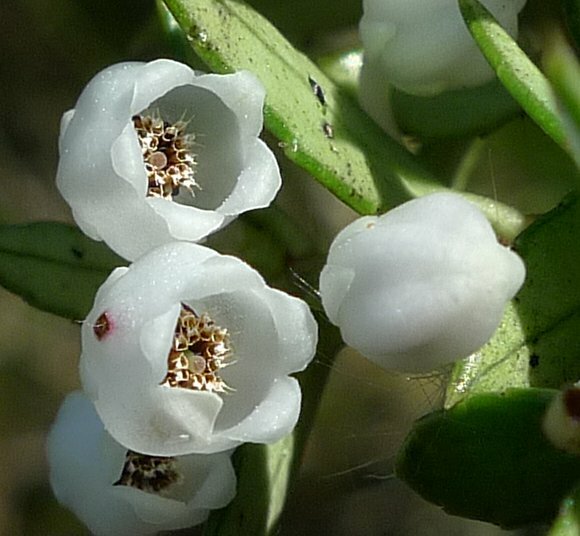 Most unusually, the five sepals are also brilliant white. Flower stalks bend downwards and have magenta tinges. 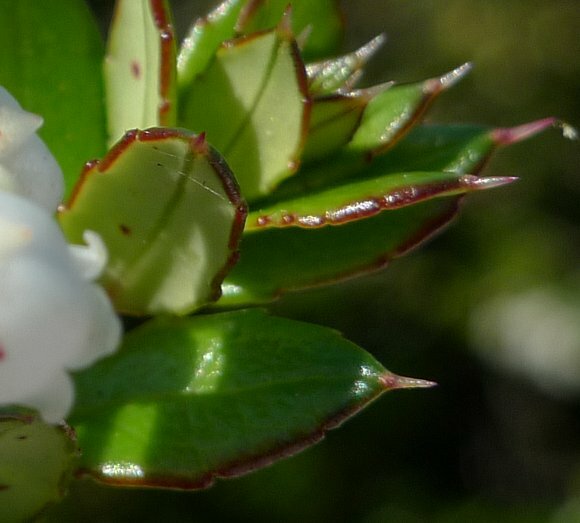 Opened flowers are bell-shaped, with five re-curled back short triangular petals. Pentagonally cusped opening of flowers. A young flower bud is light green with magenta tinges (top left). Any damage to the flesh of the flower takes on a magenta tinge. Deep within the bell a green sphere grows with a pink disc in the centre with five reddish rays. Around the periphery of the green ovary are several very short stamens, perhaps ten. Deep within the bells of pollinated flowers. Un-opened bell on right has five lobes. 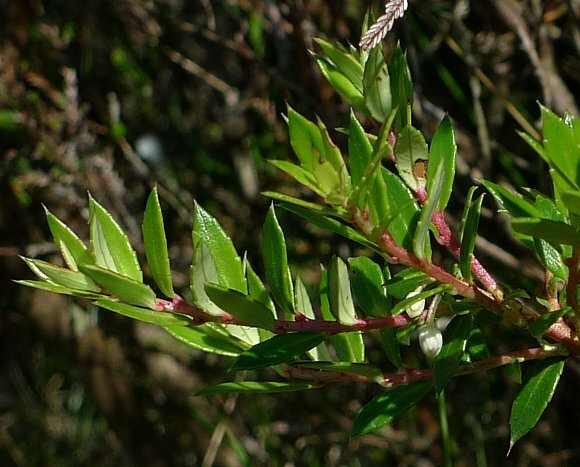 Leaves glossy mid-green on upper surface, up to 2cm long, elliptical, and with a sharp spine tip. 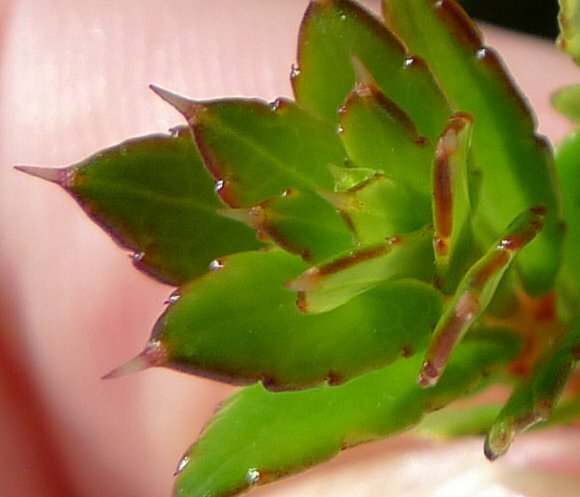 Leaves browning at the edges with a few small very short forwardly-pointing teeth. A prominent spine tips the end, hence the name Prickly Heath. Rear of leaf is matte and lighter-green, upper surface glossy mid-green. 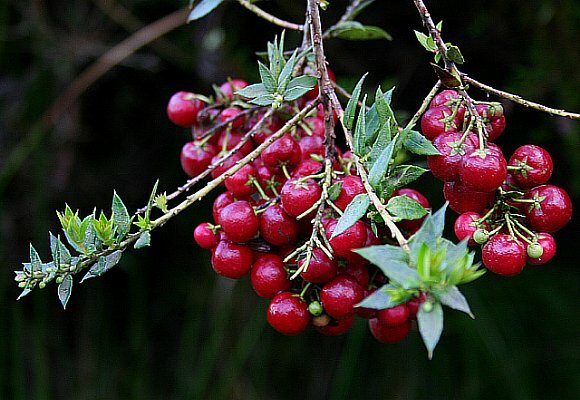 The berries are lurid pink to magenta mis-shapen spheres and about a centimetre across. 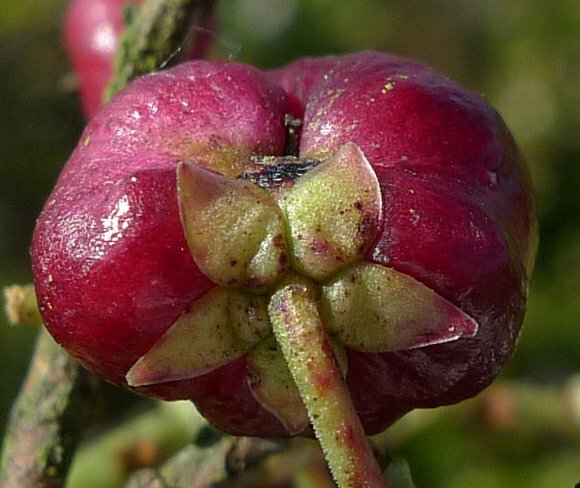 Several large seeds are contained within the berry. 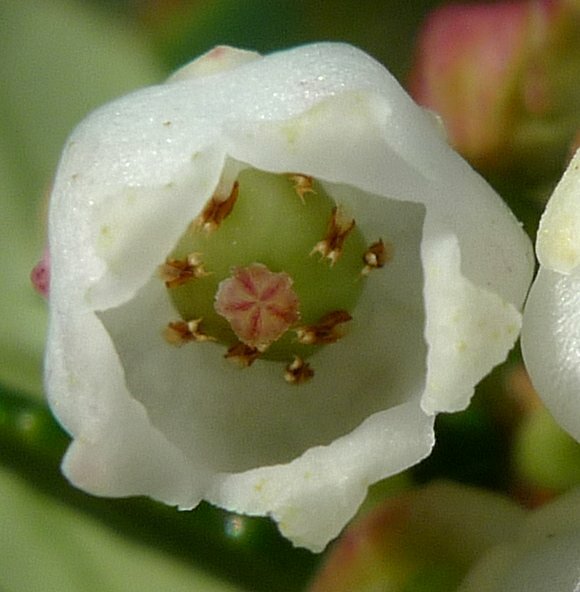 The five previously pure-white sepals turn light green. 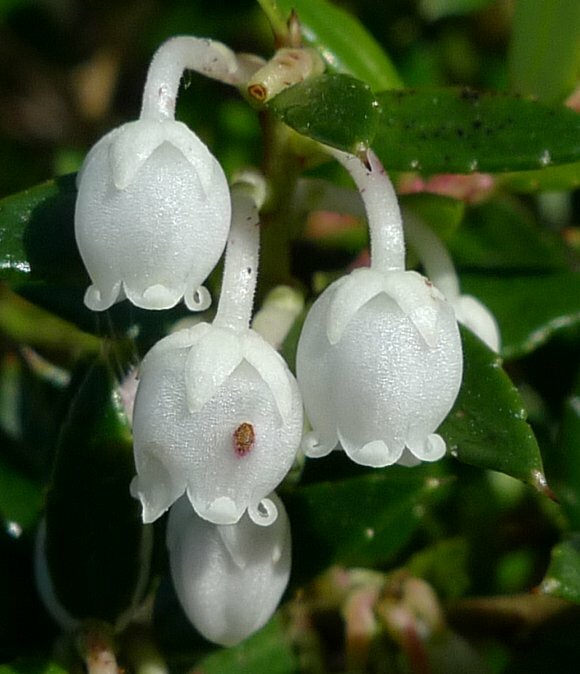 Hybridizes with : Shallon (Gaultheria shallon) to produce Gaultheria mucronata × shallon with no common name, but which hasn't been seen in the UK since the turn of the 20th Century, and even then was only found in one place in Ireland and one place near Portsmouth. 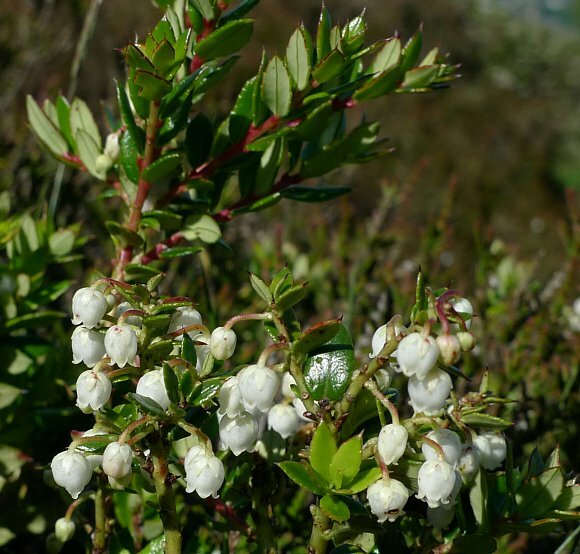 Some similarities to : Shallon (Gaultheria shallon) and Labrador Tea (Ledum palustre), both members of the same Heath family as Prickly Heath. 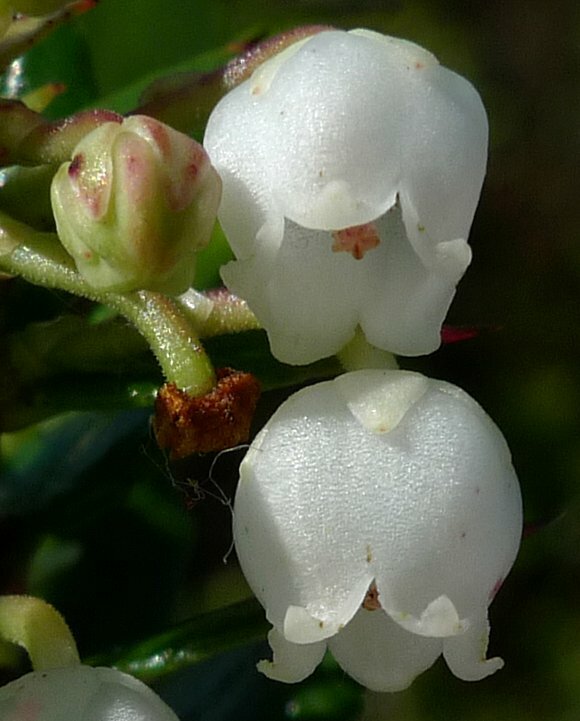 Also similar to Darley Dale Heath which also has white bell-shaped flowers, but in this case the petals are not curved upwards, and the bells are longer and have a stigma protruding. No relation to : Prickly Lettuce, Prickly Saltwort, Prickly Poppy or Prickly Sow-Thistle [plants with similar names]. 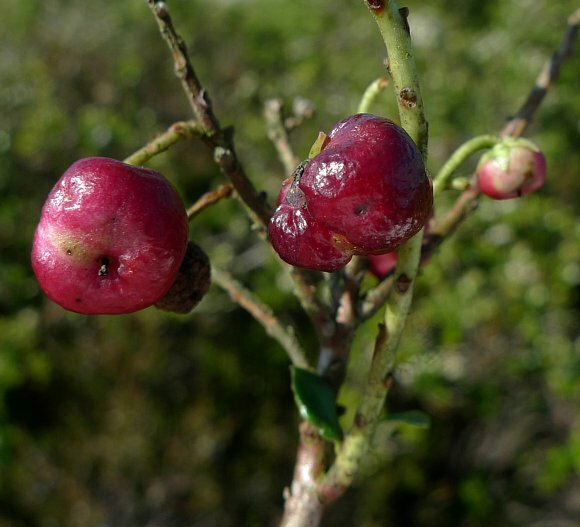 A thicket-forming suckering shrub up to 1.5 metres high. 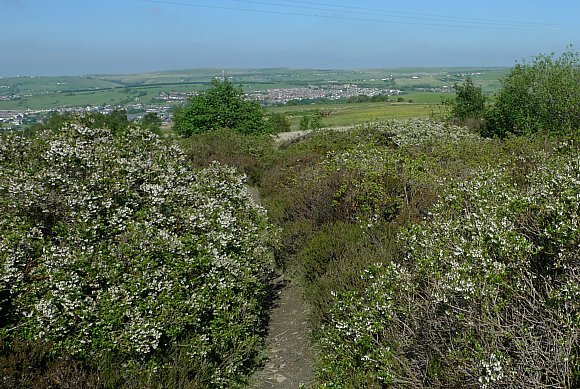 It is naturalised in scrub and woods, often on sand, but here on the slopes of acidic moorland which was once a spoil-tip for shale from the mining of coal. The spoil and shale is only just beneath the surface soil. The berries, pink to magenta here, can be white, pink, or magenta.